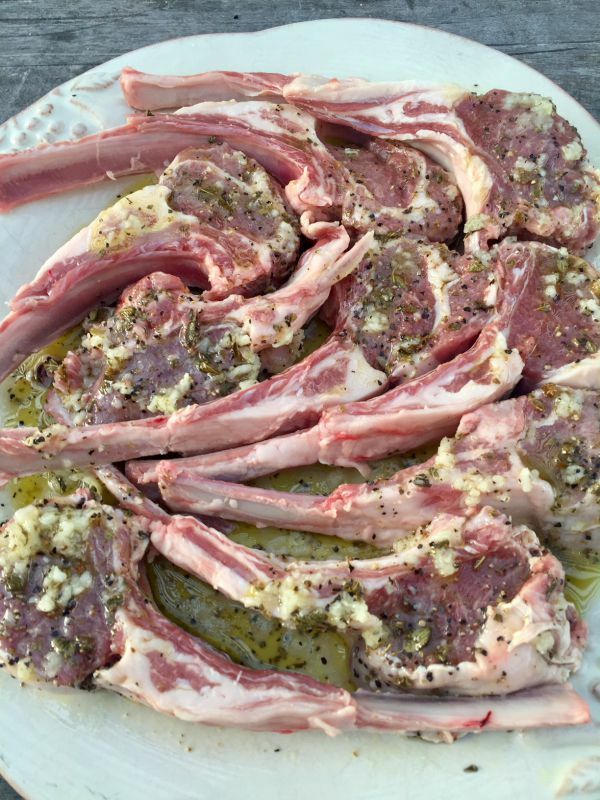 When I need a quick dinner that will satisfy a crowd, I turn to grilling a rack of lamb chops. Grilling can take place outdoors or indoors which lends itself to a meal that can be prepared year around. You can also easily purchase the amount needed by allowing 2-3 chops per person. You can have the butcher cut them for you, or you can cut them yourself. 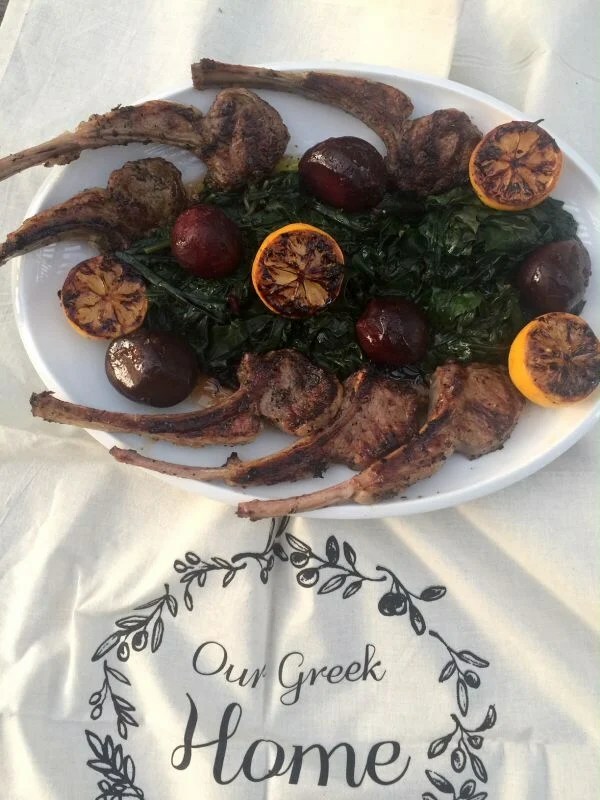 When I teach this Greek meal it is the most popular holiday or big crowd dish I make. And there is little preparation with a big bang of flavors! Baby beets or regular can be found cooked and ready to go at your supermarkets from Melissa’s Produce. How to roast beets can be found here. If you are using fresh beets, save the greens and cook them with the other greens. All you need to do is season them with the recipe below. I like to serve this family style in a large platter, with fresh lemons or grilled lemons surrounding the ribs. In Greek cooking you need just a few ingredients, fresh lemons, a good quality extra virgin olive oil, garlic and dried oregano. 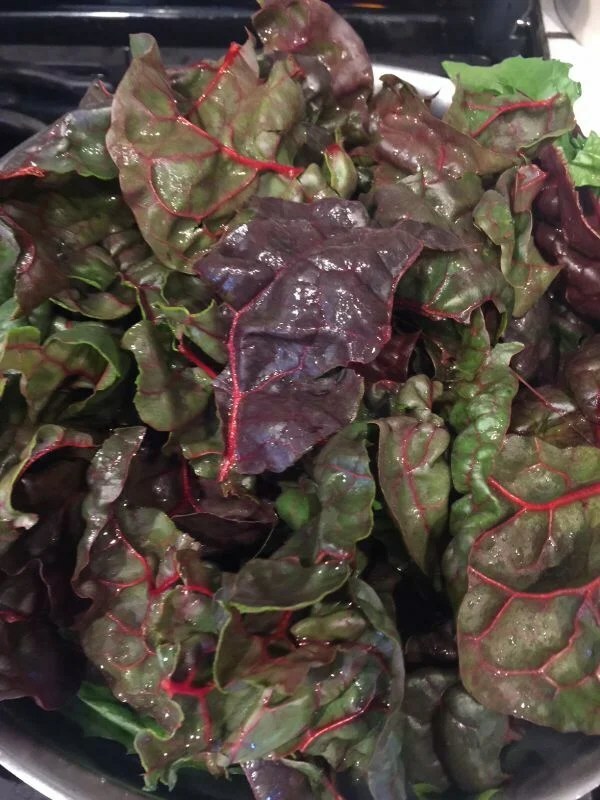 Start out by picking out your greens: I use mustard greens, swiss chard and/or spinach. Or any combination you like. Marinate the chops after cutting them in individual chops. The quick marinade are pantry ingredients. Place them on an outdoor grill or indoor grill, like I have done here. You may want to grill a few lemons to serve with the chops. 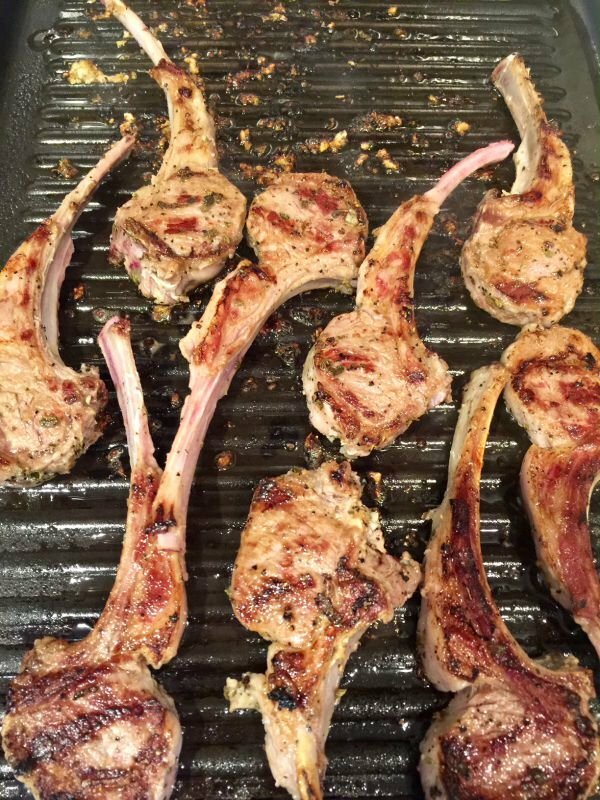 Grill the chops for 3-4 minutes on each side. Plate them on a large platter with the greens arranged in the middle and cooked baby beets on top! The beets can be substituted with cooked or grilled small potatoes. You can't go wrong serving this for your family or for a big crowd. Count on 2 chops per person, served with greens and beets. Cooked baby potatoes can be substituted for the beets. 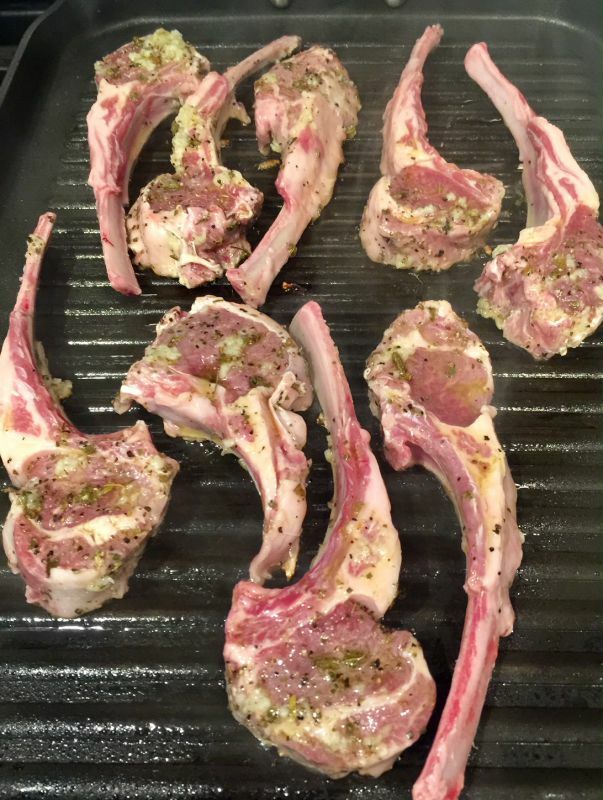 Cut your lamb chops in individual servings. Place in a bowl or plastic bag to marinate. Add the marinate and refrigerate for 1-2 hours. Heat up the grill and remove the chops from the marinade and grill the chops for 3-4 minutes on both sides. Time may vary according to the size of the chops. Add 2-3 halved to the grill and cook until browned. Remove the chops and keep warm until vegetables are ready. While the chops are grilling, cook your beets. If pre-cooked just add your seasonings. If using fresh beets you can roast them in an oven of 400 degrees for 30-40 minutes. Just wrap them in foil individually and let them roast. Test with a knife and pierce checking for softness. Remove, cool and peel. Dress with olive oil salt, pepper, minced garlic and red wine vinegar. Wash the greens with cold water. Bring a large pot of water to a boil. Add water to the 1/2 way mark. Add the greens and cook until tender, 5-8 minutes. Drain and dress with olive oil, salt and pepper and juice of one-two lemons. 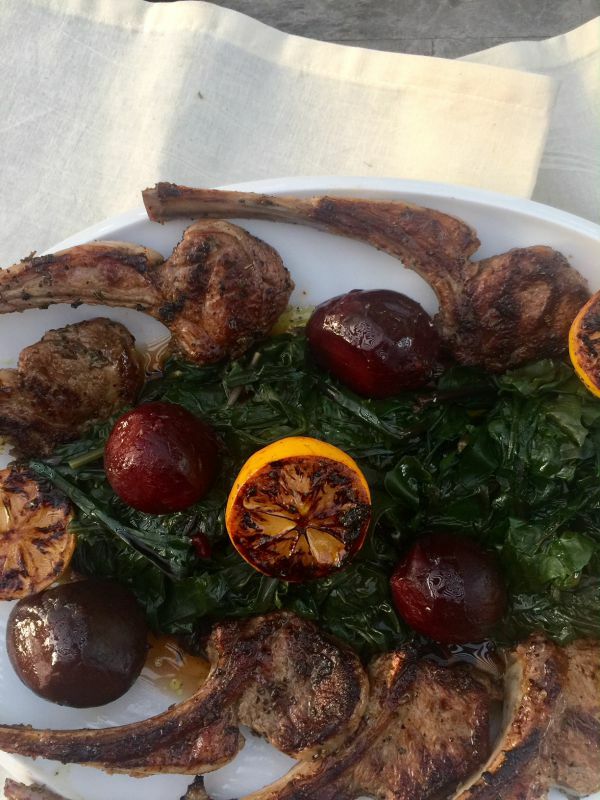 Once everything is ready, plate your greens and beets and add the chops around the platter. Drizzle with lemon juice and olive oil and serve. © 2017 – 2018, Mary Papoulias-Platis. All rights reserved.